The typical signs of a cold in infants include irritability, stuffy nose, mild fever, and then a raspy cough. Of course, there are the hidden symptoms—like headache, sore throat, etc.—that your little one can’t tell you about; so try to manage their comfort levels as best as you can. You can offer frequent feeds to boost your baby’s antibodies supply and keep them hydrated. If your baby is struggling to breathe, you can ask your GP for saline drops to help break up the mucus just before a feed. Feeding in a steamy bathroom can also help. Ditch the schedule. If your baby is tired, let him sleep. Even if it means messing with routine. Even if it means multiple naps to account for lost sleep at night. Rest equals healing! Use a vaporiser. The warm mist will keep mucus loose and aid breathing during sleep. Dab gently at a runny nose with a soft tissue—not a wipe, as excess moisture can irritate sensitive skin. Check with a medical professional before you use any OTC cold and flu remedies, or decongestants. For pain, you can administer the correct dosage of liquid infant paracetamol (as long as they are older than two months, weighing over 4 kg and not premature), or liquid infant ibuprofen (again older than 2 months, weighing over 4 kg and not premature). 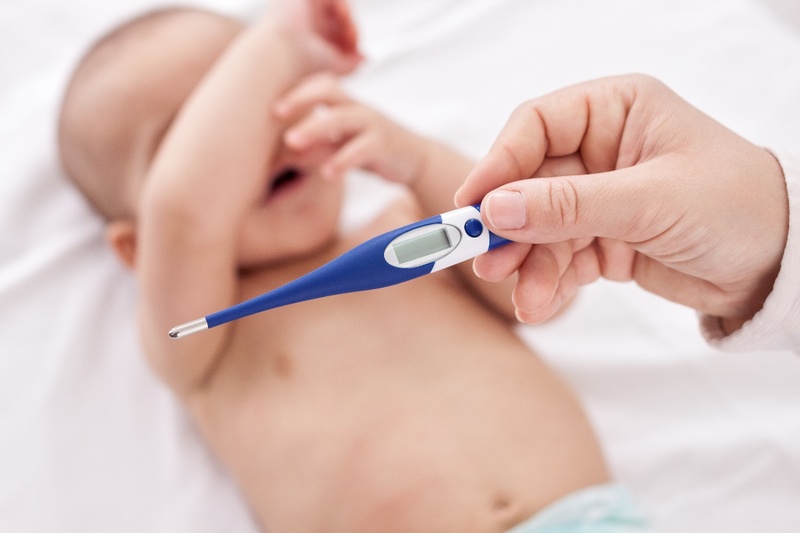 If your baby is under 3 months and his temperature reads above 38°C, take him to your doctor. Babies under six months should be seen by a GP for fevers above 39°C. It’s also advised you book an appointment if your baby is unwell and under three months—even without a fever, as their immune systems are still developing and thus susceptible to secondary infections.